Confusion has arisen all over the UK with regards to the 15th of Sha’ban. Some claim it is tonight (Friday 19th April) while others assert that it is in the evening of Saturday the 20th of April. This is therefore an attempt to investigate both claims and to further see the cause of such disagreement, as well as a comprehensive look at the whole Saudi moon sighting debate and whether Muslims in the UK should be following Saudi Arabia or not. The first of Sha’ban would determine what day the 15th coincides with in the Gregorian calendar. So, when was the first-? The attempt to view the new moon is made on the 29th night of a lunar month. If viewing is unsuccessful, one completes 30 days and the next day is marked as the first. In this case, Rajab 29th was 5th April 2019. Therefore, attempts all over the world were made to view the new moon of Sha’ban. The 5th of April however, did NOT usher in a single report from any country in the entire world. Attempts were made in the UK, as well as Morocco, Saudi Arabia, Australia, Canada, India, USA, Nigeria, Tanzania, Afghanistan, Pakistan, Egypt, and others. None of these countries or any other reported any viewings of the moon at all. Thus, Rajab was completed as 30 days and Sha’ban started from April 6th 2019. For additional confirmation, the moon was sighted on Saturday 6th April successfully from the UK (3 locations), as well as Morocco (2 locations), Australia, Saudi Arabia (3 locations), India, Canada, USA, Nigeria, Tanzania, Afghanistan, Pakistan, Egypt, Iraq, Iran, and others. If the evening of Saturday 6th April is the 1st of Sha’ban, then adding 14 nights to it would give us the 15th night of Sha’ban. So why have many mosques announced Friday night (tonight) as the 15th of Sha’ban? As there were absolutely no reports of any sighting on the 5th of April, the reason must be unrelated to any sighting. In fact, many people have forwarded me proofs that the moon was sighted on the 6th to assert that tonight is the 15th. These people need new calculators. The others have mistakenly followed Saudi’s non-religious calendar which had calculated ten years ago that 15th Sha’ban is in the evening of Friday the 19th. That brings us to the issue of following Saudi. In the past, the scholars had allowed practicing upon following Saudi Arabia for moonsighting NOT because Saudi has any monopoly over Islam – nobody has that – but because, 40-50 years ago in this country we did not have the infrastructure or the technological know how in order to carry out successful moonsighting, hence the Ulama allowed the public the liberty to follow a Muslim country for its Ramadhan and Eid announcements. In fiqh, this is called ittihaad al-mataali’ – accepting the moon sighting of another country – and Ikhtilaaf al-mataali’ – accepting only the moon sighting of your local community. The classical scholars were divided over whether a moonsighting report from another country is acceptable or not. The main dominant schools of Islam disallowed it, saying that each country had its own mataali’ – or literally, a unique horizon. They argued that a maximum distance of 72 miles can be used when it comes to accepting and following a report from a nearby town/city, hence, a different nation was out of the question. Only early Hanafi jurists were of the opinion that a nearby countries’ report can be accepted. They allowed this – but latter day hanafi jurists have disallowed it generally. Still, even the concept of ittihaad al- mataali’ seems to have been limited by distance and is technically impossible if it is to be used worldwide, due to a wide variation of time zones. In any case, even though it was problematic, it was allowed by the Ulama of this country as a concession at a time when no infrastructure existed for an accurate lunar observation here in the UK. Going back to 15th of Sha’ban, the second group of people that are citing tonight as the “Night of Power” are most definitely the ones that are following Saudi Arabia. Yet, what is astonishing about this group of people is the lack of knowledge they have with regards to what they are following. For indeed, this is nothing less than “blind following”. Because what they are following is basically a computer generated calendar. 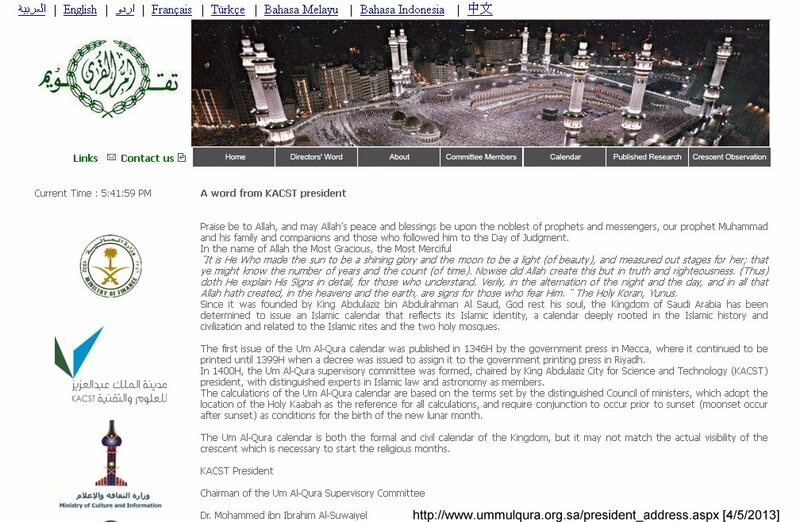 The Ummul Qura calendar of Saudi Arabia is used for its civil non-religious and business administration use. The Saudis maintain that, bar four months of the year, NO SIGHTING of the moon is attempted all year round. These four months are Muharram, Ramadhan, Shawwal, and Dhul Hijjah. That is all. So no moon viewing was made for Sha’ban – so why are people following Saudi here ? The answer is more psychological than anything else. Saudis are the current custodians of the Two Holy Mosques, and anything they pass off, is thus considered coming from the Islamic Papacy. The Pope (Khalifa) has long been dead in Islam, thanks to this very oppressive Saud Family. “We didn’t get it from any country, we don’t know what the countries are saying and we don’t care. The date, it is from our printed calendar that is all I know”. Their printed calendar is obviously the same printed dates as that calculated by Saudi Arabias Ummul Qura. Those who follow Saudi Arabia or Morocco for Ramadhan / Shawwal, do so in the knowledge that it is somewhat acceptable under the fiqhi ruling of _ittihaad al-mataali’._ However, one clear cut condition of this ruling is that two Muslims from the country in question, need to bear witness with the words “ash-hadu” that they have witnessed the moon. If this does not take place, the report cannot be accepted. There have been no announcements from Saudi, let alone witnesses. In fact, the moon failed to be spotted by locals on the 5th of April, and was instead sighted on Saturday! So if you’re going to follow Saudi, at least follow the moon reports and not their brochure that was printed ten years ago! If that is fine with you, then why not join Turkey and skip the moon sighting altogether? As Turkey has already announced the exact date of the 1st of Ramadhan! Since their calendar maintains that the 5th of April is the 1st of Shaban, the Saudis will call upon their locals to sight the new moon of Ramadhan on the 4th of May 2019 in case Shaban has 29 days. But, we know from the moon reports that the 1st was the 6th of April, therefore, the 4th will actually be the 28th of Sha’ban. However, the Sauds will be forced to issue a moonsighting request knowing full well that the Moon birth, or conjunction, will occur after 1am on the 5th of May. So they will effectively tell their people to attempt to sight the moon that they know IS NOT present in the sky as it rises post conjunction. This is also further proof that the 15th of Sha’ban is on Saturday the 20th of April. They maintain that moonsightings are attempted for the four Islamic religious months, yet, one look at their Ummul Qura calendar shows that, since 2008, they have not adjusted their calendar to incorporate human observations. What they are effectively saying is that, for the last 11 years, their calendar has guessed accurately all of the Muharrams, the Eids, the Dhul Hijjahs, and the Ramadhans every single year accurately. Like Shaykh Hamza Yusuf would say here, “This is B.S”. As for Saudi moon sighting blunders, there are far too many to mention. Suffice to say that on one occasion, astronomers were puzzled about an announcement from Saudi Arabia and they had to conclude that the only possible explanation is that the Sauds had seen the planet Saturn instead of the moon, as the moon at that point, was not physically in the night sky to be viewed. This was also reported by major news outlets such as the Guardian back in 2011. Indeed, in Makkah, the Royal Clock Tower glows with huge LED lights when the new month is announced, thus replacing the ancient sunnah method of physically searching for the crescent. Very soon, this sunnah may not be present for even the four limited occasions in the entire year. There is much emphasis with the physical phenomena in Islam, whether that’s observing the night sky with our very eyes, using water or earth for ritual purification, and placing our foreheads on the ground to connect with our “mother” Earth from whom we have all been fashioned from. “I have studied your queries very attentively. It has been written from here in the past that announcements should be made for the sighting of the moon, based on information of sightings from your close country. May Allah bless us with the practice of the Sunnah of the Messenger Peace Be Upon Him, may He grant us abundant beneficial knowledge, and may He Guide us and protect our worship from errors so that they are accepted by Him. As the sun sets below the horizon, the sky turns a deep red colour. This colouring is because the Sun’s rays can still reach the sky above it. After a while, the Sun will descend further, by a certain angle, below the horizon until none of its rays will be able to reach the sky. It is at this point we get complete darkness. Does Maghrib Begin at Sunset? The Arabic noun Maghrib comes from the root gharaba, “to depart, to set, to go away,” and the noun formed from this root literally means “the place of the sunset.” It is thus apparent that Maghrib means actual sunset or sundown, as understood universally, i.e, the time of departure or declension of the sun from the horizon when it is no longer visible. BY the grace of the Almighty, this week has ushered in a new moon. One that is among four that have been sanctified by Allah Subhanahu Wa Ta’ala. This is the seventh month of the Islamic calendar; this is Rajab al-Murajjab. Did Richard Dawkins ask us to rethink Hitler’s eugenics? The Prophet ﷺ was reported to have once remarked that vinegar was the seasoning of all the prophets who came before him. In our offices and workplaces we can hardly find time to do acts of worship and righteous deeds. What can we do in the short time that we can find in our day? How can we make use of it? Does the Quran Get The Mixing Of Saltwater And Freshwater Wrong? And I have closed my heart from everyone except you.